We are thrilled to announce that we have received outstanding national coverage for our Veterans Life Lessons initiative in the Healthy Aging Magazine, published on November 11th, 2016. To read the original article, please click here. 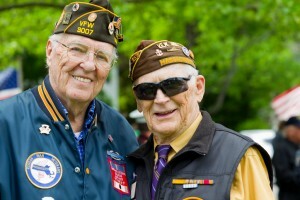 Celebrating Our Veterans Around the U.S.
From practical, lifesaving advice, “You have to duck when someone hollers duck” to career‐building lessons like learning how “to be disciplined and how to lead men, which helped later, running a business” to the simple, poignant value of “loyalty”, World War II veterans have timeless life lessons to share. Such timeless words of wisdom from those who served and sacrificed have been gathered by Watermark Retirement Communities. Watermark asked men and women in Watermark communities coast to coast, including in Pennsylvania, Delaware, and New Jersey, to share their life lessons learned while serving our country. The veterans’ words of wisdom are often short and sweet (in fact, most are no longer than a 140 character Tweet) but offer lessons with immeasurable value that span the generations. Thank you to all veterans for your service and the sacrifices you have made. An additional thank you to these veterans for sharing the most important lessons they learned from that time. To read more words of wisdom to future generations from our Watermark heroes and Veterans coast to coast, please click here.